I had read many Dr. Seuss books over the years, since I am a huge fan of his work! Now, I had finally come back to one of my childhood favorite stories of all time, “Yertle the Turtle and Other Stories” and I still enjoy it to this very day! 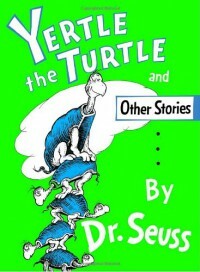 In this tale, Yertle the King of all the Turtles, wanted to have a throne where he could see everything from high above. So he decided to have the rest of the turtles climb up on each other so he could sit on them to make a throne that would reach up high into the sky. But once Yertle the Turtle became too unbearable, will the other turtles defy him in the end? In this tale, a young bird named Gertrude McFuzz wanted to have a beautiful tail like Lolla-Lee-Lou. So, she decided to visit her uncle Dake and he tells her that in order to grow a beautiful tail like Lolla-Lee-Lou, she has to eat a pill that grows on the pill-berry vine on the top of the hill. But, will Gertrude go too far once she decides to eat all of the pills on the pill-berry vine? In this story, a rabbit and a bear were both arguing amongst themselves about who is the best animal in the world and they try to outdo each other with their sense. But when a worm comes by, will he set both the rabbit and the bear straight? Dr. Seuss has once again created a truly brilliant and engaging book where each story details the consequences of letting too much pride cloud your good judgment. I enjoyed all of the stories in this book as each story shows a different take on characters becoming too self-absorbed into themselves in certain situations, such as “Yertle the Turtle” showing the consequences of letting the power go to your head, “Gertrude McFuzz” which shows that you should just be yourself and “The Big Brag” which shows that there are better things to do than just bragging. Probably the story I enjoyed the most was “Yertle the Turtle” since I loved the solution to the problem of Yertle making all the other turtles stand on each other to build a throne that can reach the sky (it is a pretty funny solution)! Dr. Seuss’ illustrations are as usual creative and humorous to look at as it is mainly done in black and white colorings with green and blue being the only other colors in this book, which gives the illustrations a distinctive feel. Overall, “Yertle the Turtle and Other Stories” is a truly fantastic collection of stories that can be used to teach children about the importance of being humble in your actions and to not become too self-absorbed in yourself. I would recommend this book to children ages four and up since there is nothing inappropriate in this book and the format would be easy for smaller children to understand.